Alaine C. Lookingbill, 86, of Cambridge, died Friday, July 6, 2018, at her home. Funeral services will be held at 10:00 a.m. Wednesday, July 11th at the Cambridge Chapel of Stackhouse-Moore Funeral & Cremation Services. Rev. David Joyce will officiate. Burial will be in the Rock Island National Cemetery. Visitation will be from 5 to 7 p.m. Tuesday at the funeral home. Memorials may be made to the Cambridge Ambulance Service or the Cambridge Fire Department. Alaine Cecelia Fischer was born October 2, 1931 in Newark, New Jersey, the daughter of Raymond F. and Madeline C. Goetchius Fischer. She graduated from Barringer (NJ) High School in 1950 an attended the St. Barnabas School of Nursing. She worked as an emergency room nurse after nursing school. Her marriage to Leon G. Lookingbill took place on April 17, 1954 in Denville NJ. He passed away on October 30, 2006. She worked summers as a clerk for Prudential Insurance from 1947 to 1950 and then worked part time for a public service energy group from 1954 to 1956. 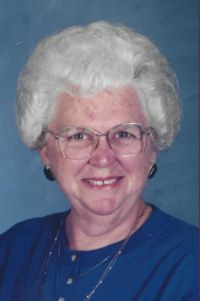 Alaine was a Girl Scout and leader for 19 years, and while in high school, she sang in the church choir, was a member of the Roseville Singers for five years, and did ballet at the New York Civic Center. Alaine was a member of the Cambridge United Methodist Church and enjoyed all kinds of crafts. Those surviving are a son and daughter-in-law, Bruce and Marietta Lookingbill, a son-in-law, David Matheny, and a daughter-in-law, Dee Lookingbill, all of Cambridge. Other survivors include eight grandchildren, Stephen and Joy Matheny, Elyse Littrel, Kale Lookingbill, Kenny, Kassandra, Kyle, and Kristofer Lookingbill, ten great grandchildren, Dakota and Blaze Matheny, Legion Huffman, Zane and Gunnar Matheny, Hayden, Braylen, and Tayven Littrel, Kennedy and Drehman Lookingbill, and a brother, Raymond (Anita) Fischer, Jr., Lady Lake, FL. Her parents, her husband, a daughter, Susan Matheny, and a son, Lee Lookingbill, preceded her in death.